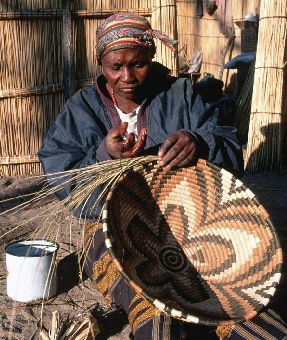 Basket making in Africa is an ancient skill that has survived to this day. Not only does it continue to play an integral part in modern community life but in some countries it has evolved to a highly expressive contemporary art form. Nowadays, while the methods of basket making are still held in regard, the materials have significantly changed from natural fibers to include man-made creations like plastic, wire and recycled products. Historically, baskets have been used for agricultural practices such as winnowing and sifting and the collecting and carrying of crops as well as portage of produce to markets. Household usage included storage and serving of food and beverages and filtering beer during its production process. Spices and tobacco were stored in basket containers. 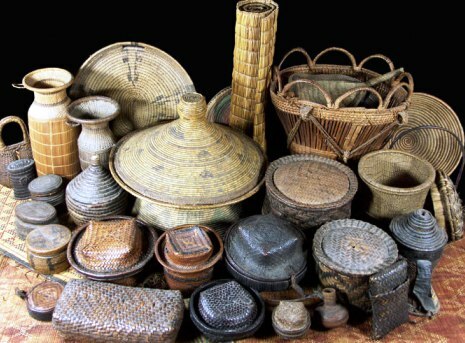 "Different African traditional baskets" baskets from Amhara, Bamum, Barotse, Baule, Berber, Chokwe, Kuba, Moors, Ngbandi, Pende, Pygmy, Zulu, Tuareg. 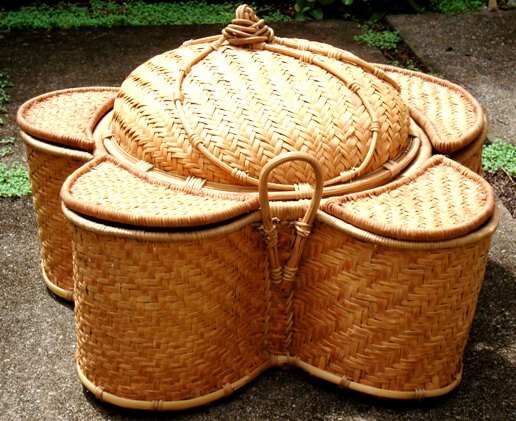 Less secular uses for traditional basket containers include money banks, jewelry boxes and divination vessels. These normally have lids and can be quite complex in design which reflect their significance. They are often decorated or have stepped lids, footed bowls and sometimes are strengthened with leather or bark to ensure longevity of use. Rice storage stacks can form part of a bride’s dowry in places like Guinea and Liberia. 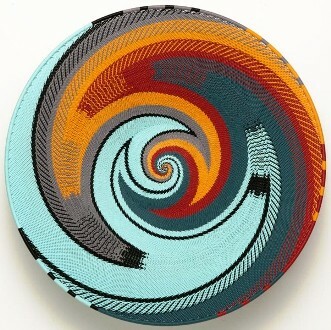 Woven basket fibre products include sleeping and eating mats and fish traps, hand bags and carry baskets. 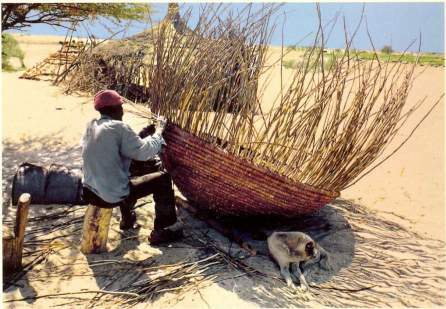 Traditional fibers used in basketry reflect the local habitat. They include illala palm, sisal leaves and fiber, raffia (African bamboo), fibrous tree and plant roots such as makenge, vines, leaves (banana and fan palm), cane, bark wood and papyrus. Two types of vegetative fiber are normally used to make a coiled basket, one for the inner coil and one for the wrapping of the coils. 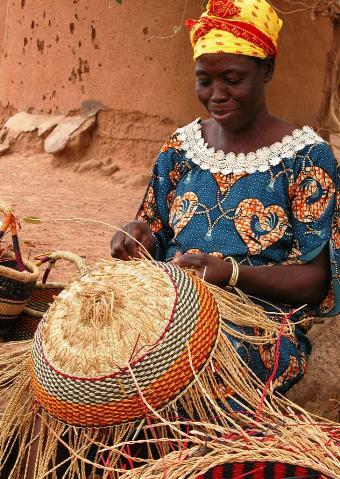 For example, in Uganda and Rwanda, baskets are woven from raffia or papyrus wrapped and stitched around a coil of banana leaf stems. Grass is often used for the core of the coils. Size, shape and features of the basket are determined by the end usage. A vessel can be circular, oval, square or conical, occasionally even multi chambered. It can have an open bowl, be a tray or a pannier, exhibit a foot, a lid, a handle or an extra appendage for hanging. When extra strength is required the basket design can include leather or bark strips woven or sewn onto the walls or base. Sometimes, baskets have embellished rims or are adorned with shells, beads or seeds. They can be covered with clay or packed with mud or resins and fat to make them waterproof. Before the actual weaving can take place, the fiber has to be prepared which according to the character of the twine can be an extremely lengthy process. This is especially so if it needs to be dyed as well as made pliant. A fiber such as sisal needs to be stripped, cleaned and spun by hand, a process which can take up to 16 hours for a medium size basket. 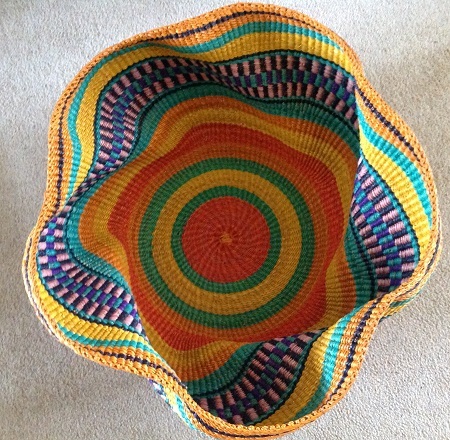 The design of the basket is created by weaving with different colours. Dyes are obtained from natural sources like roots, barks, fruit and berries, leaves, clay, dung or various combinations of the above. Patterning can be in the form of decorative bands or geometric shapes; lozenges, triangles, diamonds, star or flower shapes, zigzags, swirls or chequerboard motifs. The design of the pattern can be emphasized by the use of different contrasting colours or the fiber can be left in its natural state producing lovely textural effects. Weaving an intricate design into the basket can be equally lengthy a task as preparing the fiber. Tightness of weave, intricacy and smooth transition of pattern and design, good design spacing, ability to shape large bowls, create unusual forms and most of all, pull at the same pressure ensuring an even basket. While a community will have hundreds of weavers, only a handful will acquire this status and they will be almost wholly female. Togo, Senegal, Burundi, Namibia, Mozambique, Eritrea and Mali. 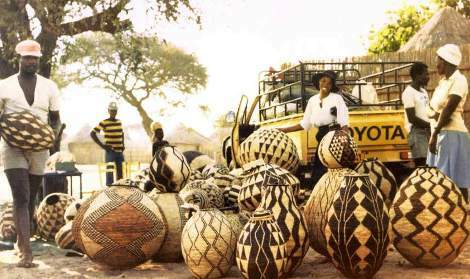 There is hardly a country in Africa that does not have an indigenous group of people that exhibit some form of basket craft. 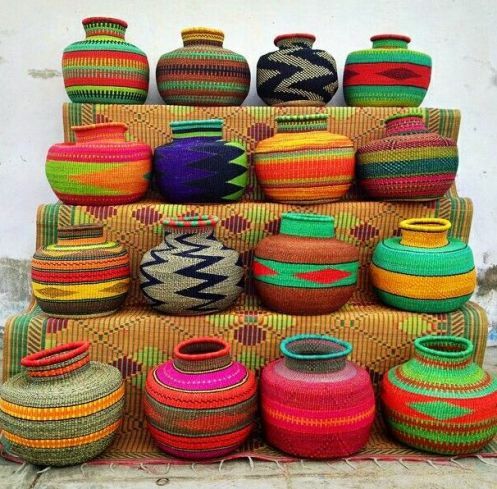 What it means is that basketry is a form of employment for many African women and elevates their status and power base within their social environments. There are many organized workshops and institutions that help these women successfully market their product. 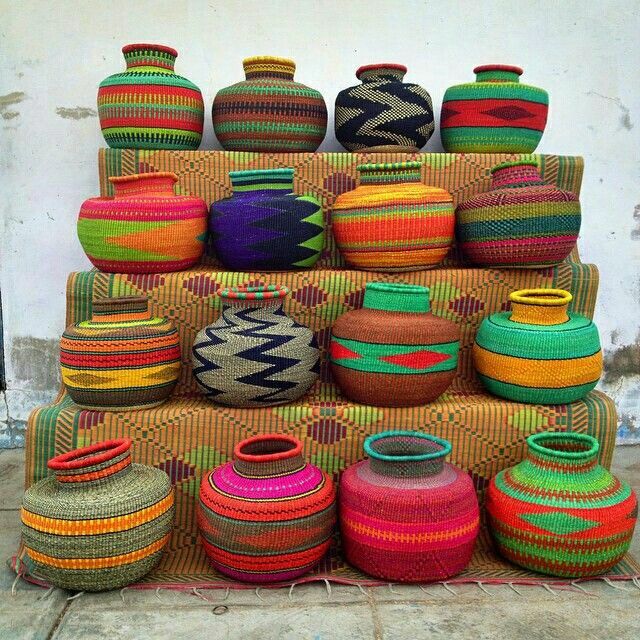 Basketry cooperatives bring income to rural areas and keep the craft traditions alive. Given this wide dispersal of product, bright, colourful commercial dyestuffs have been applied to widen their appeal and make them ‘market-friendly’. 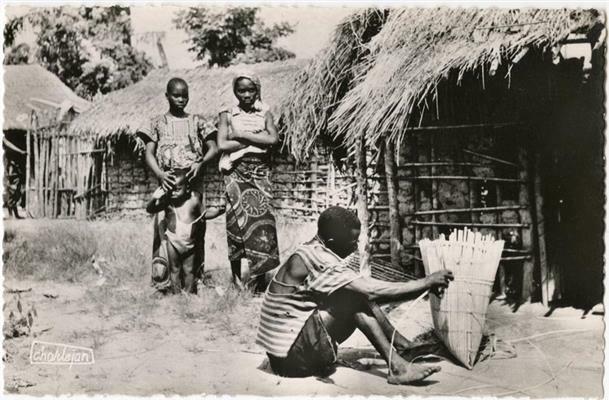 One can argue that this takes away from the authenticity of the product but as it was stated in the beginning of this page, African basketry is a dynamic thing and this is just one of the ways that it has moved forward. 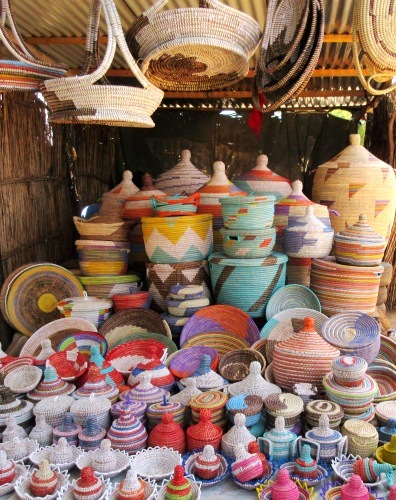 Modern communities continue to make baskets for their own use but in a growing trend, the impressive skill involved has meant some crafters have been encouraged to produce for purely aesthetic reasons alone. Museums all over the world purchase these beautifully designed and engineered baskets for their collections, while art galleries sell them as ‘studio’ items, recognizing their value as collectors’ art pieces. Different weaving fibers are now used to make contemporary baskets: Telephone wire, copper wire, beads, plastics, recycled bags, tin, recycled fabric over Ilala palm. 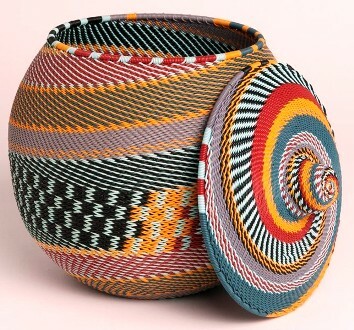 In South Africa men are involved with weaving the wire baskets, a tradition that started with night watchmen being bored on duty and it has now developed into a sought after art form. 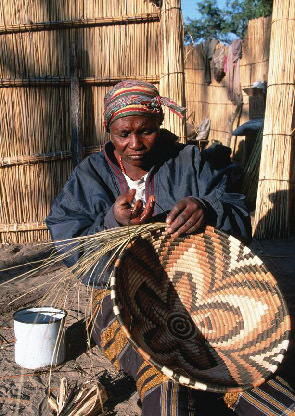 Basketry is a form of employment for many African women and elevates their status and power base within their social environments. There are many organized workshops and institutions that help these women successfully market their product. 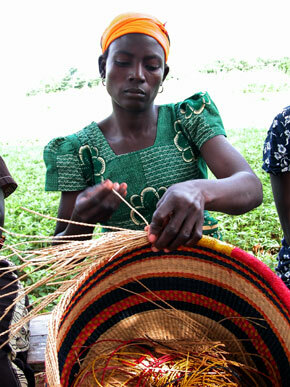 Basketry cooperatives bring income to rural areas and keep the craft traditions alive. Given this wide dispersal of product, bright, colourful commercial dyestuffs have been applied to widen their appeal and make them ‘market-friendly’. 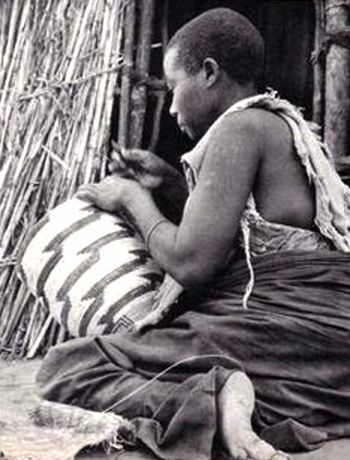 One can argue that this takes away from the authenticity of the product but as it was stated in the beginning of this page, African basketry is a dynamic thing and this is just one of the ways that it has moved forward. It has led to some very visually stunning work which allows one to fully appreciate the consideration given to design and patterning. The Baba Tree has its headquaters in Bolgatanga in Ghana's Upper East region and this Co-Operative employs dozens of weavers, sometimes up to the 100's if a special order is required. They produce amazingly beautiful shapes and designs in all colours, both bright and natural. 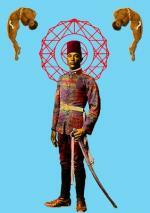 Do visit their website to see the full breadth and depth of their collections. The Baba Tree Co has a philosophy to make sure their employees are rewarded justly for their individuality and this has produced incredible results like the basket you see below. 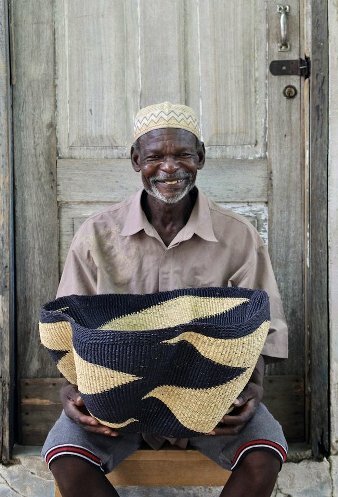 A workshop called 'Designing the Difference' in Dec 2013 brought together NID Outreach Programmes, The New Basket Workshop and Ghana's Bolgatanga weavers to create high-end innovative products.